Home → Libido → Men over 30, Testosterone declining? Testosterone levels in men begin to diminish around age 30. In fact, by the time men are 60 years old, they typically produce 60% less testosterone than they did at age 20 (a man’s sexual peak). As testosterone levels decline, men tend to notice a loss in muscle mass and strength, and a gain in body fat—especially in the abdominal region, the most dangerous place to store fat! Thankfully, hormonal fidelity can be repaired through a program of proper diet, exercise and naturally proven nutrients. Ultimate Male Energy™ incorporates natural ingredients like: Chrysin, Stinging Nettle Root Extract, Indole-3-Carbinol and Broccoli Sprout Powder to help restore healthy hormone biochemistry and reduce the symptoms of declining testosterone levels. When testosterone levels drop, the libido that once never failed you, is all but gone! The natural ingredients, including Tongkat Ali, found in Ultimate Libido™, are not only safe for daily use, they work as a natural aphrodisiac to enhance excitability, promote stronger erections and better orgasms. Prostate problems are also a common affliction for men as they age. Over 30 million men throughout North America suffer from a condition called benign prostatic hypertrophy (BPH), which represents the enlargement or swelling of the prostate gland. 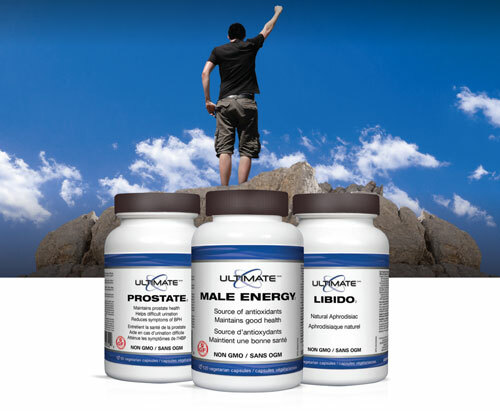 The twelve 100% natural research-proven ingredients within Ultimate Prostate™ work to support and enhance overall prostate health naturally and reduce early symptoms of BPH, including urination difficulties.